March 17th is not only St. Patrick’s Day, but also, in Suffolk Co., Massachusetts, Evacuation Day (of Lord Howe from Boston). And March 15th is not only the Ides of March, but in the Trazwicky (Transue + Zwicky) household for many years also Removal Day (from Palo Alto to Columbus OH). Days for leaving. Evacuation Day is a holiday observed on March 17 in Suffolk County, Massachusetts (which includes the cities of Boston, Chelsea, and Revere, and the town of Winthrop) and also by the public schools in Somerville, Massachusetts. 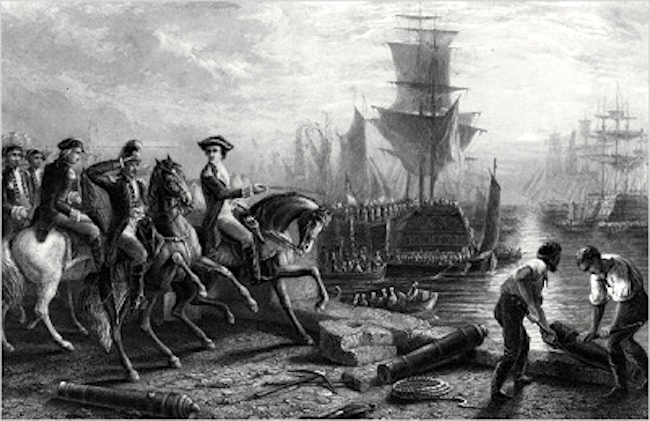 The holiday commemorates the evacuation of British forces from the city of Boston following the Siege of Boston, early in the American Revolutionary War [in 1776]. Schools and government offices (including some Massachusetts state government offices located in Suffolk County) are closed. If March 17 falls on a weekend, schools and government offices are closed on the following Monday in observance. It is the same day as Saint Patrick’s Day, a coincidence that played a role in the establishment of the holiday. Back in Massachusetts, when Ann Daingerfield (Zwicky) and I lived there (1962-65), Evacuation Day was celebrated as a holiday even in Middlesex County (where Cambridge is located), next to Suffolk County. In fact, it was, like Sundays, a legal Day of Rest, on which various commercial activities were banned. One annoying consequence of that was that we couldn’t use the neighborhood laundromat on Evacuation Day. Removal Day. Annually, Jacques and I left Columbus for Palo Alto by car on December 15th (during Christmas break from my universities) and then left Palo Alto for Columbus on March 15th (during spring break from my universities). The drive west was often harrowing: there sometimes were snowstorms and icestorms, and in California, dreadful tule fogs. The drive east was generally uneventful, but it did mean leaving a green California full of flowering trees and other spring delights and going back in the seasons through brown, still lifeless landscapes. One year there was a significant snowstorm in Columbus the day after we arrived there, which we thought was especially cruel. In any case, the removal east meant driving south and east in California to Needles, then across northern Arizona (Flagstaff), northern New Mexico (Albuquerque), and the Texas panhandle (Amarillo), then angling northeast across Oklahoma (Oklahoma City, Tulsa) and Missouri (Springfield, St. Louis) and east across Illinois and Indiana (Indianapolis) and western Ohio to Columbus. About 2,650 miles. On that schedule, we would have arrived in Columbus yesterday or today. This entry was posted on March 20, 2018 at 6:05 am and is filed under Art, Holidays, My life. You can follow any responses to this entry through the RSS 2.0 feed. You can leave a response, or trackback from your own site.